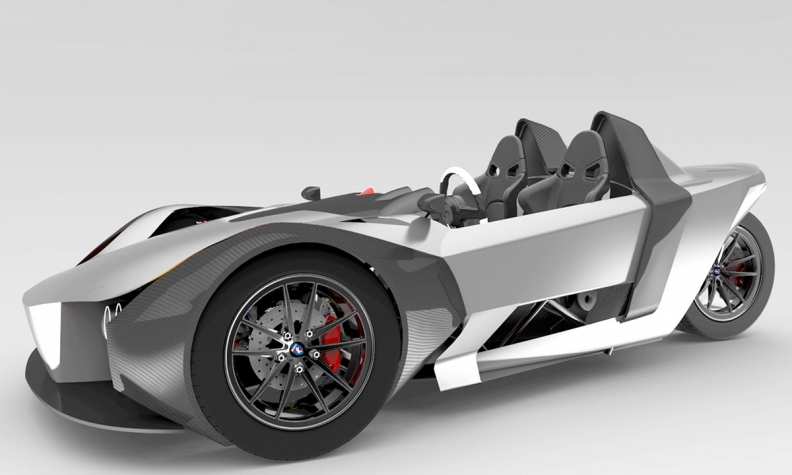 In its base form, the three-wheeled electric Azkarra is claimed to reach 200 km/h. Customer deliveries of the electric roadster were to begin at the end of January, but it’s the premium model’s three-wheel drive system with torque distribution, and an electric motor at each wheel, that’s raising eyebrows. The Azkarra will be available in two versions: rear- or three-wheel-drive with one or three electric motors. Equipped with three, the premium Azkarra S is quicker than most supercars. With torque transfer capabilities, the Azkarra S manages the power delivered to each wheel, increasing traction. It will perform the standard zero-to-100 km/h sprint in 2.5 seconds, which is about on par with a 1,000-horsepower Bugatti Veyron. The base model covers the same ground in 4.5 seconds, in league with the 2016 Mustang GT and Subaru Impreza WRX STi. Simon Luc Bouchard, a 30-something actuary turned entrepreneur, is the brainchild behind the Azkarra. “I always wanted to be a businessman, and my passion for cars goes as far back as I can remember, so I decided to start my own car company,” he says. Bouchard founded Atelier Girfalco Limitée in June 2016 with two employees, Charles-Antoine Bonin and Sam Kandaleft. Bonin, an engineering student from École des technologies supérieures de Montréal, took a break from his studies to join Girfalco and take charge of the mechanical design of the Azkarra. Kandaleft, recently graduated in Industrial Design from DawsonCollege, is in charge of the vehicle’s visual and ergonomic design. To achieve these performance levels, the Azkarra produces a continuous power of 54 kilowatts (74 horsepower equivalent) and a peak power of 75 kilowatts (102 horsepower). For the S version, power increases to 162 kilowatts (220 horsepower) and 225 kilowatts (306 horsepower) respectively. Maximum speed will be electronically limited to 240 km/h for the S and to 200 km/h for the base model. Pricing starts at $67,500. The S version with more engine, more power and more equipment, will make a bigger hole in buyers’ budgets at $97,500. The current goal is to build 100 Azkarra vehicles in the next four years for Canada, the United States and Europe, Bouchard says.